Be Smart about Seed Beads! Seed beads, those small beads that come in so many colors and finishes can delight the eye. They can also drive you crazy. If you want to know how to choose the right beads for your project, how to make art or jewelry with seed beads, or why your beads aren't behaving properly, You've come to the right place. If you want to know the right beading techniques for the right project, or how to get started with those alluring little beads, or how far you can go with them....you have come to the right place. The site is continuing to grow with new pages almost every week, so I hope you will check back often to see what's new. If you have questions you'd like to have answered on the website or ideas about the directions we are already going (or should go), you would be doing me a big favor if you go to the Contact page and tell me what's on your mind! Welcome to the bead party. Would you mind pouring the iced tea while I set out another plate of cookies to share? Be the first to know about all the latest additions to SeedBeadSmarts.com, your source for seed bead information, free learning projects, and bead artwork. 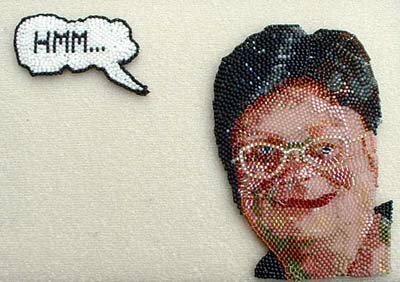 Bead Art Experiences and Inspiration for Bead Artists, including articles on mounting and displaying your beadwork and more. Smart Seed Bead Information. To the outsider all seed beads may look the same, but insiders know there are crucial differences. Plus ideas for storing your beads. You can get free beading instruction at Seed Bead University. While we are not a real university, we are a real site for learning. Learn basic techniques plus plenty of projects to teach you more. Free Beading Projects for kids groups and kids classes are always useful. Here are 7 Free Beading Projects that you can do with children. If you want to learn beading, I've got some strategies for you about the process of learning as well as the resources to help you learn. Entering a beading contest or challenge can seem overwhelming. Here are some thoughts on the different sorts of contests to get you thinking. Starting a Jewelry Craft Business can seem daunting, but Oran Bumroonchart makes it easy. Follow along with his story, then write your own business success story. Beading Tips include tips on choosing the right needles, threads and beads, and working smart with good lighting, magnification, and ergonomics. I am Virginia Brubaker, a bead artist. This page tells you a little about me and why I created this web site. Contact SeedBeadSmarts with your questions or comments. Your ideas and feedback help improve the site. I love to hear from you.